Ten pedaling parents loaded their bikes with camping gear (some more elegantly than others) and made the trek from Seattle to Bainbridge Island for a superfun bike camping adventure! Julian of Totcycle masterminded the whole thing as part of the Summer in Seattle Schedule of Kidical Mass. We’ve never bike camped before and brought almost as much stuff as we bring car camping…except no dog, no balance bikes, and no queen-sized inflatable mattress. The full-sized camping stove and four full-sized pillows will probably stay home next time, but we opted to go for comfort this first time out. Mr. Family Ride hauled our single Burley trailer crammed full of the heavy stuff while I carried kids and lighter bulky stuff. I used my WideLoader on one side and had to resort to the aid of one bungee cord to hold my mass in place on the other. was in town and accompanied us to the ferry. He’d left his Surly Big Dummy at home for his more Amtrak-friendly and GORGEOUS Rivendell A. Homer Hilsen, with homegrown kid platform on the back rack. He took a lot of great photos of our ride. Here’s The Main Tank and me side-by-side on Alaskan Way while our littles seem to be communicating “What have we gotten ourselves into?” to one another. And winding our way though South Lake Union to the ferry terminal. We were forced to avoid the easiest route along the Elliott Bay Trail because it was closed to through traffic to host Hempfest. My previous bike-on-ferry experience was during Chilly Hilly where checkin was across the street with Cascade Bicycle Club so it was a new experience to pay at the toll booth and board as a regular bike passenger. But is equally exciting to ride onto the ferry in a huge Chilly Hilly pack or compact Kidical Mass. Once on the island, we made a lunch stop at Pegasus Coffee House and I realized I’d packed way too much food. Of course, we could have sat outside and made sandwiches to lighten our load, but this was much more fun. Then we began our hilly trek to the campsite in Fay Bainbridge Park. Here we are heading north away from Winslow on Ferncliff Ave. There were lots of streets with “cliff” in their names. I saw a “Garibaldi,” too, and I’m sure it wasn’t the only street named for a mountain. Things flattened out when we reached the coast and we had a lovely spin along Manitou Beach Drive until Biking with Brad led us away from an appealing (and flat!) NO CARS/BIKES ONLY beach path for a shortcut up Falk Road. He was too far ahead to hear the grumbling, but there were some choice words said between pants and wheezes. I made it up the hill, but only because my rig is way too heavy and bulky to walk uphill. But we all made it up, some with a few short rests along the way–something I probably should have tried, but I was scared I’d have trouble getting started if I stopped. I was definitely the slowest of the pack…though in retrospect I was the only person carrying two kids so I’ll let myself off the hook. Fay Bainbridge is a great park–though down a steep hill I opted not to think about until Sunday morning. The car camping spots were a bit cramped, giving their area a parking lot feel, but we bikes were directed to the grassy field by the beach. It was a bit cold for the water (more unused gear–swim suits and four beach towels), but the kids climbed over beached logs and played on the adjacent play structure. We broke camp Sunday morning to ride back to Winslow for Bike for Pie. Mr. Family Ride was able to get his bulky messenger bag into the trailer and I moved one of the kid sleeping bags to the back for a much slimmer load day two. Julian and Kevin did some derailleur work before heading out. Dig the campfire kindling bike repair stand. We stashed our gear before starting Bike for Pie and I thought we’d have an easy time of it for the 12-mile family course. But family-friendly on Bainbridge Island doesn’t equate to flat. Silly me. Near the pie stop, I saw a kid with training wheels and an adult on a minibike, but I can’t imagine they did the whole course; it was hard! But the event was wonderful. The 32-mile challenge route had two pie stops while our 12-mile family route had just the one. The stop was well-stocked with pies of many varieties (though only sweet at this stop, while the other one had sweet and savory, we heard) as well as music and dancing. Everyone had a lot of fun and a few people had already decided by this morning that they’d do it again! I’m going to need to rest a little bit before I’m to that point, but I know there will be more bike camping and more biking for pie, though possibly not in conjunction with one another, somewhere in my future. I’ve put my photos in a Seattle Cargo Bike Roll Call Flickr set which will hopefully attract more photos of the day. Morgan of Bike Works is out of town (in Portland with many of our Greenway organizers collecting exciting ideas), but Davey Oil used her awesome recumbent cargo trike to bring his daughter and folding cycle truck to the event. I think this may be the smallest load it’s ever carried. Morgan tends to pile it with cargo bikes and tow three behind. It was test ridden by many and Davey gave lovely tours of the park. I enjoyed life as a passenger for a change as Davey pedaled me and a couple kids around. Davey also provided Bike Works stickers and temporary tattoos for the piñata. 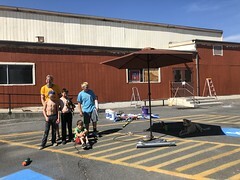 I had visions of dangling a car-shaped piñata it from one of the cement arches while we rode bike and attacked it joust style with a seat post, but by the time we got to it, Davey and the seat post had pedaled off and it turned into a more kid-friendly affair. Fortunately, one of the kids had a very firm sparkly wand that worked great and Julian of Totcycle facilitated the destruction of the cheerful Cars movie happy birthday piñata. Oh, and there were lollipops in there, too, so the kids didn’t just go home hot and dirty–they were sugared-up, too. I love kid-toting cargo bikes, but am also intrigued by utility-only cargo bikes. Check out this awesome ANT basket bike with canine passenger. I wish I’d taken a picture of my bike on the way to the party. I put on my WideLoader to carry the two balance bikes on one side and on the other wide put my road bike (front wheel in the bag, back wheel towed behind), snacks, bike decorating supplies, and toys. But that was the easy part–in my front basket I put a large insulated back filled with ice packs and drink boxes. Some day I hope to have a bike with a frame-mounted front basket and carry heavy loads with ease. I rode that down and Hum of the City, who is visiting from San Francisco, took Leya’s Kona MinUte down. Leya is out of town, but generously let me borrow her new MinUte because everyone who rides one falls in love so we had to have one on hand! The road bike was so I could rush back home solo to grab The Main Tank’s Madsen bucket bike from my garage where we borrowed it for Hum of the City to use on Thursday. Hum of the City left part-way through the party via Uber car service (brilliant!) to get to the train station and head to Portland for a week of cargo bike test riding (…and Kidical Mass…and another cargo bike roll call…) so I had the exciting task of getting three cargo bikes back home. The kids stayed and partied while I took the MinUte home first and headed back to the park on my road bike. I was planning to take Big Dummy with kids, road bike, and as much stuff as I could squeeze on next and then chase them back down to the park on foot while they balance biked and wedge it all into the Madsen (“wedge” because of the big cooler). But luckily, Forrest didn’t realize how heavy the Madsen would feel going 10 blocks up Meridian Avenue and suggested he ride it home and then walk back down to fetch his regular bike. I hope he’s still cargo-curious! A month ago I decided what I wanted for my birthday was a cargo bike roll call so this was essentially a birthday party I threw for myself. It’s a wonderful way to get a bunch of awesome people to show up and hang out for the day! I didn’t alert the masses ahead of time about the birthday aspect, but I don’t think anyone minded my sneakiness. The Biking with Brad family brought cake and snacks and Brad played happy birthday on his accordion. I couldn’t have asked for a better day, let alone a better almost-my-birthday! Other exciting birthday stuff included my new mud flap from Tarik of T’s Leatherworks. Yippee! I’m sorry I don’t have more specific details, but there was so much distracting awesomeness! My 38 pictures in the Flickr set have descriptive titles so check them out. We’ll most definitely roll call again!